The evening of Tuesday the 14th on Main Beach, Laguna residents were met with something unexpected. Laguna Beach Police, Fire, and Marine Safety, as well as OCSD Harbor Patrol, congregated at the shore following reports of a 26’ boat running aground. The two uninjured occupants, a local transient and a man from Laguna Niguel, had arrived on Main Beach after the vessel had suffered from electrical problems. Instead, the boat was deemed a hazard, and Marine Safety took custody and responsibility of it. They monitored the boat overnight and called in Public Works in the morning to pull the boat further up the shore during high tide, twelve hours after the boat ran aground. The boat was removed Wednesday morning. In February, a man entered a Laguna Beach yoga studio and ransacked the lockers, later using stolen credit cards to pay his bill at a local restaurant. He left town on a train, and continued his life of crime at stops between San Francisco and San Diego over the next few months. Douglas Schlichting was arrested in June by the Coronado Police Department, and on Monday, pled guilty to charges of residential burglary and identity theft. As a third strike felon, Schlichting faces a mandatory minimum prison sentence of 11 years and 8 months. “He also has a probation violation out of San Francisco, where they will choose to sentence him to an additional 8 years consecutive or concurrent,” said Cota. Schlichting’s sentencing will be on January 9, 2018. Wednesday evening, a drunk man on Cleo Street got unruly with officers. Joshua Szalanczy, 21, Florida, was passed out on the sidewalk when officers arrived to check on him. When officers placed him under arrest, he tried to fight with the officers, biting one in the leg in the process. In the end, the officers prevailed and Szalanczy was arrested for being drunk in public and felony battery on a police officer. The bitten officer was not seriously injured. Thursday morning, fumes from paint cans permeated the area of Canyon Acres Drive and Laguna Canyon Road. Timothy Payton, 26, Irvine, was apprehended and admitted to spray painting the rocks, concrete and trees in the area. On Friday evening, a fight over a cell phone on Main Beach escalated a bit too far for one of the parties involved. A group of three men was squabbling over who among them was the rightful owner of a Samsung cell phone. Joseph Hogsten, 30, no fixed address, was prepared to go to any means necessary to prove the phone was his. “Hogsten hit two men in the head with a flashlight,” said Sgt. Jim Cota. One of the victims reported that he was losing consciousness while on the phone with the police department. Hogsten was arrested for assault with a deadly weapon, with bail set at $25,000. Multiple shoppers at Ralphs on Monday evening, likely stocking up for Thanksgiving, were met with an unpleasant surprise… their wallets had been stolen. “Two suspects, a man and a woman, worked in conjunction with each other to systematically distract women and steal their wallets from their purses in their shopping carts,” explained Sgt. Cota, LBPD spokesperson. Two victims came forward, reporting that their wallets had been stolen around 6:20 p.m.. The total reported loss at this point is $102 and credit cards. The suspects were not seen entering any vehicles. If you recognize the suspects, or have any information, please contact the LBPD at 949-497-0701. In June, a woman went to Bank of America to cash a check. Trouble was, that check was stolen, and so was the ID she used. When officers responded, the woman had left the scene. LBPD detectives had only the surveillance footage provided to them by the bank to solve the crime. In an effort to maximize the resources available to them, LBPD sent out crime bulletins to other police agencies, and posted stills from the video on their Facebook page. Lo and behold, a Facebook follower recognized the woman in the video – a prior resident of Laguna who had moved away a few years ago. Alexandra Hovas was located and arrested on November 13. She has been charged with check fraud, identity theft, and other fraud and theft related charges. On Thanksgiving morning at 1:16 a.m., callers reported hearing a crash in the area of Park Avenue and Tahiti Avenue. A helicopter was called in to extract the driver, a Laguna Beach man in his 20s, from the bottom of the ravine. He was taken to the hospital with critical injuries. In August, an unknown suspect poured gasoline on a eucalyptus tree a block away from Thousand Steps Beach. The fire department responded to absorb the fuel, and a consulting arborist was called in by the city’s Public Works and Code Enforcement departments to evaluate the tree. “Public Works staff followed the consulting arborists’ recommendations to remove the fuel and periodically visited the site to monitor the situation and evaluate the health of the tree,” said Shohreh Dupuis, director of Public Works, in a letter. At that time, the tree did not appear damaged beyond recovery. That did not last long. A few weeks later, the foliage turned brown and the canopy began to die. A dozen nails were found in the tree trunk, which were removed immediately. “During the follow up inspection, the arborist suggested that the damage caused by the vandalism had systematically affected the tree to a level that was likely to be irreversible,” said Dupuis. The tree has not recovered and is now dead. The Public Works department is following the City Council’s Public Tree Removal Policy for its removal, as it has become a fire hazard. “We have a war on trees going on [in this town],” said Mayor Toni Iseman. Last November, someone cut gashes into five eucalyptus trees in front of Montage Laguna Beach. And in May of this year, several nails were hammered into a tree in the 1000 block of Cortez. Unfortunately, LBPD is not actively investigating the recent vandalism that killed the eucalyptus tree because they have no leads on the incident. The National Weather Service has issued a Red Flag Warning effective through Thurs, Dec 7 at 11:59 p.m. A high wind watch has also been issued where wind speeds between 20-40 mph and gusts of up to 60 mph are possible. Laguna Beach residents should refer to the Ready! Set! Go! Program available on the Fire Department website (www.lagunabeachcity.net/cityhall/fire). Register for AlertOC, the city’s mass notification system, by going to AlertOC.com. To ensure you are contacted during a Red Flag Warning, please register with the Nixle Red Flag group by texting “LBRedFlag” to 888-777. Residents should be aware of parking restrictions in the Diamond/Crestview neighborhood during Red Flag Warnings. Any vehicles parked in spaces marked with a “red flag” in the center may be cited or towed. The National Weather Service extended the Red Flag Warning for the Orange County Coastal Zone through Saturday, Dec 9 at 8 p.m. Police and fire personnel urge an elevated sense of awareness during these extreme weather conditions. Laguna Beach Fire Chief Kirk Summers reported that LBFD had two engines and two Battalion Chiefs assigned to the Thomas Fire in Ventura County on the fire lines Thursday. Jordan Villwock, the city’s Emergency Operations Coordinator, reported that CERT volunteers were posted at Alta Laguna Park this week as a visual deterrent and for public outreach. “The PD is using Beach Patrol Officers to maintain a fire watch there during the night,” Summers added. The Police Department is also enforcing Red Flag parking restrictions in the Diamond and Crestview neighborhoods. 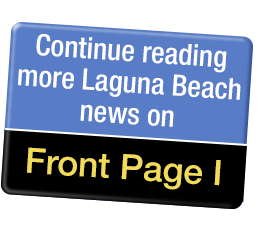 “The Great Laguna Coast Fire Safe Council activated their Red Flag Patrol earlier this week, so you might see cars driving around town with red flags,” Villwock said. City Council Bob Whalen said that he believed the situation brought attention to the need for undergrounding utility poles along evacuation routes. “Over the past few days the wildfires raging throughout Southern California have required over 100,000 to flee their homes in minutes. The speed with which the fires have spread is incredible,” said Whalen said. “Watching people run from their homes underscores for me how crucial it is to all of us in Laguna to underground the utility poles on Laguna Canyon Road and other evacuation routes in the city. This will be the first priority in the city’s undergrounding plan. “I am confident that voters will understand how crucial this plan is to public safety and will support it at next November’s election,” he concluded. Laguna Beach residents should take this time to evaluate their preparedness levels, Villwock said. He asked that residents refer to the Ready! Set! Go! Program available on the Fire Department website (www.lagunabeachcity.net/cityhall/fire). Villwock also encouraged residents to register for AlertOC which is the City’s mass notification system by going to www.alertoc.com. Residents should make sure to include cell phone number, text number, and email addresses so that they can be contacted no matter where they are. In order to ensure they are contacted during a Red Flag Warning, residents should register with the Nixle Red Flag group by texting “LBRedFlag” to 888-777. The Laguna Beach Police Department is currently accepting applications for the upcoming Citizens Academy. The academy starts Thurs, Jan 25, 2018, and will meet from 6 p.m. to 9:30 p.m. for 12 consecutive weeks (the 13th week is graduation). Applications will be accepted until Jan 19, 2018. This is a non-stress course designed to provide community members with a better understanding of the LBPD and to help foster communication between police personnel and citizens. The academy course includes instruction in the following areas: History of the LBPD, investigations, traffic enforcement, accident investigation, driving under the influence investigation, gangs, narcotics, neighborhood watch, crime prevention, crime scene investigation, police K-9 program, volunteer programs, and other relevant topics. There will also be a tour of the LBPD and the OC Jail. Academy members will be given the opportunity to shoot at the police firing range and participate in mock scenarios. On Sunday, December 3, a bag containing about three dozen syringes and a metal spoon were found in the 300 block of St Ann’s Drive, near Neighborhood Congregational Church and a preschool, Montessori School of Laguna Beach. “The combination of syringes and a metal spoon usually means heroin use,” explained Sgt. Jim Cota, LBPD spokesperson. They were collected and booked for destruction by officers. While the police department has located and seized many syringes before, “At church grounds is concerning to the PD,” Cota said. On Friday, December 8, at 9:40 p.m., officers initiated a traffic stop in the area of Thalia and S. Coast Hwy. The driver, identified as Tatiana Vasilevskaya, 40, Aliso Viejo, was found to be driving under the influence and was subsequently arrested for DUI. Unfortunately, she wasn’t the only one in the car. With the added charge of child endangerment, Vasilevskaya’s bail was set at $100,000. Stu News wanted to hear the details about our firefighters on the front line of the Thomas Fire, so we asked Fire Chief Kirk Summers if we could talk to some of the guys – and the answer was no – not because they didn’t want to be interviewed – because, as the Fire Chief explained, with great pride, “They are still up there! They are on the line today after resting yesterday, they are doing 24-hour shifts. I would anticipate that they will be committed to the fire at least through the end of the week and maybe longer. Weather forecasts are predicting continued warm and dry conditions and possibly Sundowners. Many folks up there are expecting to be doing mop-up into January,” he told us. We are lucky here in Laguna to have such dedicated, hard-working, and courageous firefighters. We’ll be writing the full story of their experiences when they’ve had time to rest – by which time, let’s hope we’ve had some rain. “These thieves are looking for anything visible of value in plain view or vehicles left unlocked,” said LBPD’s Sgt. Jim Cota when asked about a recent string of vehicle burglaries. Whether or not the seven thefts that occurred between Sunday and Tuesday are related is still being investigated. Sometime late Monday night, two pairs of sunglasses valued at about $1,000 were taken from a vehicle (most likely left unlocked), and $500 worth of Christmas presents were stolen from another unlocked vehicle. One victim noticed items missing from their car on Monday. Two cars on a driveway were searched by a burglar on Sunday, and both were said to have been left unlocked. One victim’s vehicle was locked on Sunday, but the burglar still managed to steal $500 worth of shoes and clothes. Another strike on Sunday left the victim missing their wallet and $400 in gift cards, and yet another victim’s glove box was riffled through. “We need to get the message out: remove all personal items of value from your vehicle, and always lock your doors,” Cota said. On Saturday, at around 1 a.m., a driver on Laguna Canyon Road noticed someone driving erratically, weaving and almost hitting the reporting party. Naturally concerned, they called the police. Officers arrived shortly thereafter and began a routine traffic stop. They soon realized that they had on their hands a veritable mobile pharmacy. “There were so many different pills, it would take half a page to write them,” said Sgt. Jim Cota, LBPD spokesperson. A few of the more popular drugs found upon searching were: marijuana, morphine, oxycodone and methamphetamine. By volume, the most confiscated were 120 Topiramate tablets, 57 Carisoprodol tablets, 40 Hydrocodone tablets, and 30 Suboxone tablets. Despite this impressive array of medications, the driver was not a doctor, and did not have any affiliation with a medical clinic. The driver, Shauna Kester, 30, Garden Grove, was arrested for two accounts of possession of drug paraphernalia, for being under the influence of a controlled substance, and for possession of a drugs for sale. Bail was set at $20,000. This was one of the largest if not the largest pill busts of the year by LBPD, according tos Sgt. Cota.